Manufactured with heavy gauge zinc-plated steel back. Genuine neoprene blade has excellent wearing qualities. Steel handle accepts any Speed Sweep® bolt-in handle with 3/8" stud. Part number M190300 handle recommended. Heavy gauge steel back is curved for water retention. Neoprene squeegee blade is chemical and abrasion resistant. Steel socket accepts any Speed Sweep® bolt-in handle with 3/8" stud. Part number M190300 handle recommended. Flex Squeegy™ has a soft blade that works well on smooth and textured floors. Double blade dramatically reduces floor drying time. Blades are closed-cell foam material commonly called "moss." 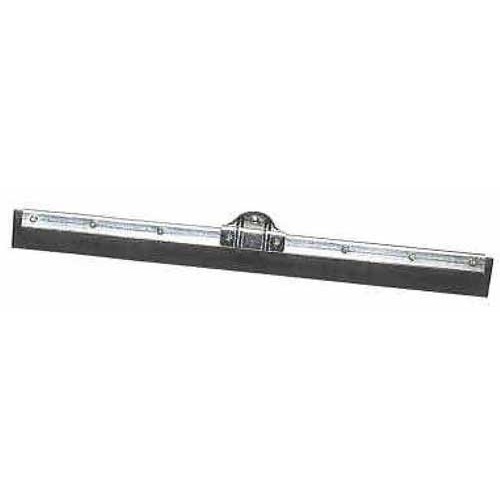 Requires part numbers M191000, M190300 or M191200 sectional handle with 3/8" stud. Socket attachment allows for forward and backward strokes. Blade is split down the middle for double scraping surface and faster drying. Accepts any Speed Sweep® handle with 3/8" stud. Combines features of moss rubber with popular Flip Flop® style. Unique socket allows for both backward and forward motion, while the moss rubber blade leaves the surface especially dry. Accepts handle part numbers M190300, M191000 or M191200 sectional handle. Can be used in food processing, food service, laboratories, healthcare, or anywhere hygienic cleaning tools are required. Polypropylene housing holds a moss rubber squeegee blade. Has unique handle socket with a compression lock system for secure attachment. Requires HySweep™ part number M195615 (fiberglass) or M195715 (aluminum) handles.